ENTEBBE – The Civil Aviation Authority has confirmed that the Ethiopian Airlines flight no. ET 338, a Boeing 737-800 Aircraft, which overshot the runway on landing at 12.41 has been was removed from the runway end. According to a statement by the Civil Aviation Authority, the airline regulators in Uganda, the runway have been cleared at 10.15 am and flight operations resumed. “Please proceed with your scheduled flight in and out of Entebbe International Airport,” the authority wrote in a statement. This was after concerted efforts in liaison with Ethiopian airlines and other stakeholders that ensured removal of the aircraft from the runway end. The Civil Aviation Authority in an earlier statement said all the 139 passengers and the crew on-board disembarked safely. 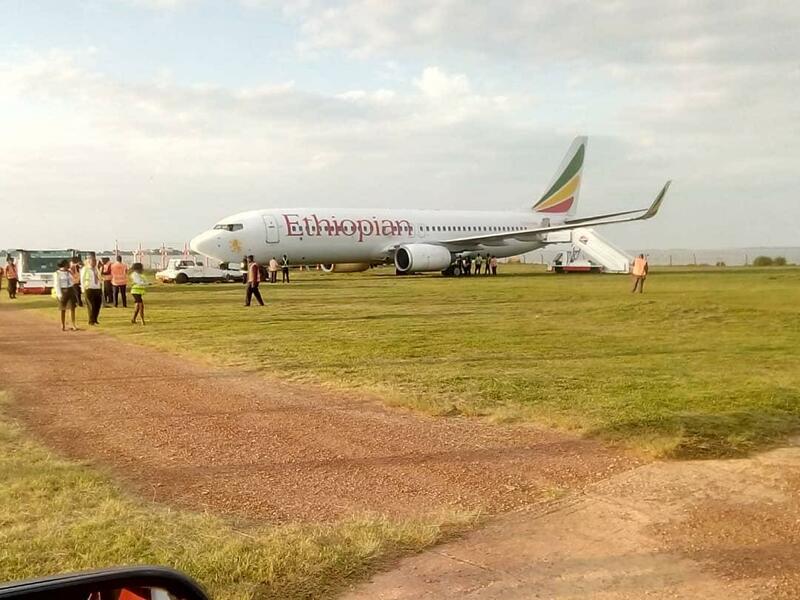 The plane, flight number ET 338 was coming from the Ethiopian Capital, Addis Ababa to Uganda was not damaged in any way according to Ethiopian Airlines but the company maintains that it is investigating the cause of the incident.